Maine Gov. Paul LePage delivers his speech at the Maine GOP Convention Sunday at the Augusta Civic Center. AUGUSTA, Maine — Gov. Paul LePage began his speech Sunday at the Maine Republican Party convention by saying he was glad he wasn’t campaigning. He then proceeded to give to a friendly and cheering audience 25 minutes worth of remarks that sounded a lot like a campaign speech. Maine’s governor also took specific aim at two men who are not current opponents of his. LePage touched on a number of accomplishments of the Republican-controlled 125th Legislature and listed areas where he believes more work needs to be done. He spent the most time talking about welfare. 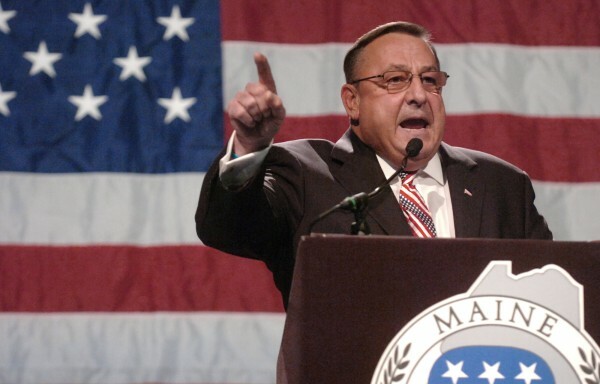 LePage said the Legislature must summon the courage to pass structural changes to the state’s welfare programs. That last line earned a standing ovation. Moving on to energy allowed LePage to take aim at another political independent: former two-term governor and current U.S. Senate candidate Angus King. LePage moved on to bonds and reiterated the same point he’s made for the last two weeks. “I refuse to allow bonds to be passed until the Maine Legislature balances its budget and pays its bills,” he said. “Our Democratic friends claim the solution to our problems is more borrowing. Rep. Rich Cebra, R-Naples, introduced LePage by calling him a “breath of fresh air” in Augusta.